Day of the Triffids dust jacket in need of restoration. The restored dust jacket for Day of the Triffids. Much of the value of a modern first edition resides in the book jacket. Fragile in nature, wrapping around the hard covers, they have received the hardest wear and often discarded when they became torn and tattered, making those that remain all the more valuable. Careful dust jacket restoration includes removing any tape or other poorly made repairs, properly mending tears and filling in paper losses. These are all common skills of a bookbinder. To these the restorer of dust jackets must add a high level of skill in color matching and a high level of ability in copying the original image. Taff’s lifelong work with a brush as a fine artist painting in high detail gives her just such ability. You can see examples of her paintings here. 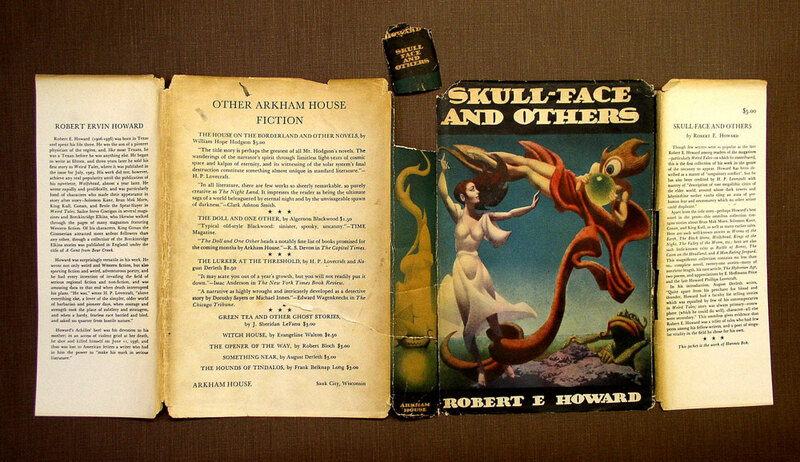 Skullface dust jacket before restoration. Skullface dust jacket after restoration. The Dain Curse dust jacket before restoration. The Dain Curse dust jacket after restoration.